Finally, a relief from the lack of newness in center core, we spied delightful bowties for women in classic Hermés prints. These petit silk accessories reflect the increased interest in chokers and add fun and whimsy to everyday dressing. This was a huge trend for women in the 80s (when women wore business suits), and it’s back with a few twists. 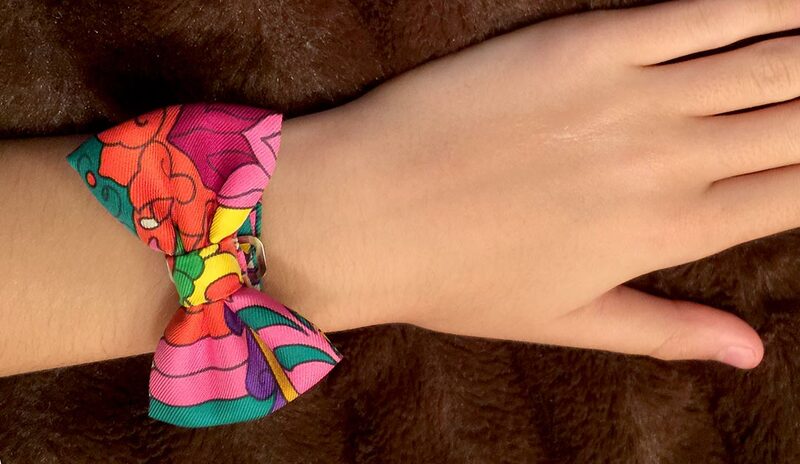 This fabulous item may be worn with a blouse, a bare neck, and the most fun way (in our opinion), as a bracelet. We heard that they are selling out in various shops in Europe, but have not been spotted in the U.S., as of yet, according to our shoppers. We expect this to be a hot item when it does hit the states, and believe that it will be interpreted at lower price points.